As Vernon Photographers, Kate (my incredible associate photographer who has been working with me for 12 years and photographed my own wedding) and I have photographed a lot of weddings. Every single one has left it’s own unique fingerprint in our memories. For the lovely wedding of Bill and Trish, Kate and I will always remember it with the word FAMILY. 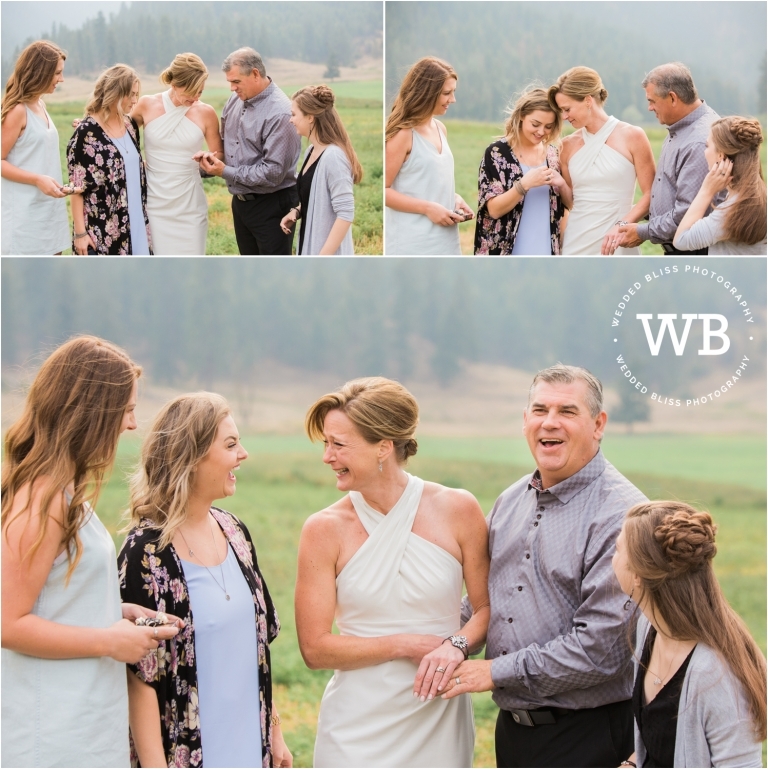 We often have “First Looks” (where the expectant groom gets to see his gorgeous bride before the ceremony) but our first look with Bill and Trish will be etched in our minds for the fact that their three beautiful daughters looked on. And cried. And giggled. And got as emotional as their parents did. They are a tight knit group and we loved them being a part of their parents day! Trish and Bill are also the type of clients who just naturally fit into each others arms. They are more comfortable in front of the camera, snuggled up together and we just loved creating these beautiful portraits for them. They find strength, security, joy and love in each other and I think it radiates out from each image. 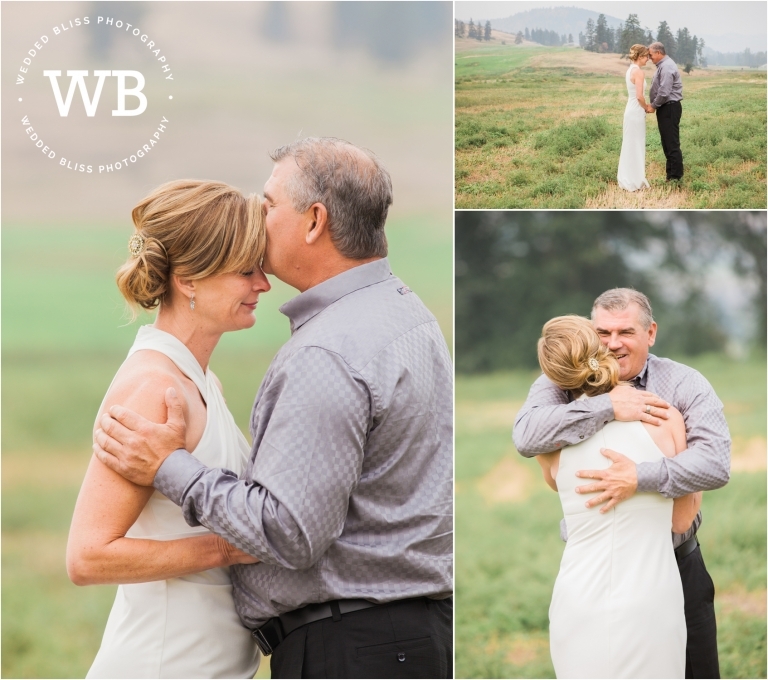 Their ceremony, at the historic Coldstream Ranch in Vernon, which Trish’s dad owns, was laid back, fun and a reflection of the wedding they wanted to have. It was one big party! Trish and Bill, thank you for entrusting Kate and I to capture all the love, joy and emotion of your exciting day. It was an honour and we were thrilled to be a part of it! We wish you all the happiness in the world! Wedded Bliss Photography specializes in wedding and engagement photography in Kelowna and Vernon shooting at locations such as Summerhill Pyramid Winery, Cedar Creek Estate Winery, Bottega Farm Inn & Studio, Silver Star Mountain Resort, Manteo Resort, Durali Villa and others, and are Vernon Photographers. Wedded Bliss Photography specializes in wedding and engagement photography in Kelowna and Vernon shooting at locations such as Summerhill Pyramid Winery, Cedar Creek Estate Winery, Bottega Farm Inn & Studio, Elysium Gardens, Manteo Resort, Sparkling Hill, Durali Villa and others.